"A touch of bacon and a splash of apple juice enhance the savory flavors in this traditional beef, potato and cabbage dish. 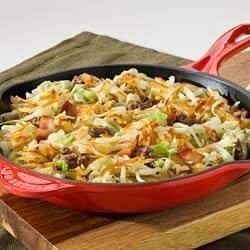 Enjoy this easy skillet dinner on nights when there's no time to cook." In large nonstick skillet heat oil over medium-high heat. Cook Simply Potatoes Shredded Hash Browns according to package directions. Meanwhile, cook bacon, ground beef and onion in 12-inch nonstick skillet until meat is browned. Drain grease. Add cabbage, beef broth, apple juice and salt. Reduce heat to low. Cover; cook until cabbage is tender. Stir in cooked hash browns. Start your day right with this hearty one-skillet hash! Simply wonderful and quick to make. Yes, it does need a pinch more salt. I also sprinkled a little cheddar cheese on top for fun. Made it just like recipe and sprinkled shredded cheddar on top. Yum! Lots of food! We made according to the recipe. It needed salt and pepper. It turned out to be soggy. My family loves this dish! The only thing I change is that I substituted more beef broth for the apple juice.